These Pacific razor clams freshly dug from an Alaskan beach are ready to be cleaned for New England style clam chowder, a fry (see recipe below), fritters, or sautéed with garlic and served on pasta. Two summers ago on our favorite clamming beach we couldn’t dig ’em fast enough. Each time we spotted a tell-tale dimple and sunk our shovel or clam gun into the wet sand, the disturbance would cause a half dozen other clams to show. The beds were dense and we sometimes dug up prized razors two at a time. It took us barely an hour to each fill our 60-clam limit – and a good bit of the afternoon that day to clean those 120 clams. This year the digging was considerably slower. Heavy winter storms had wreaked havoc on the beaches, washing out beds and decimating populations. The Alaska Department of Fish and Wildlife lowered the limit from 60 clams to 25 per person, but few clammers are finding even those numbers. Still, with low tides exceeding -5 feet and a morning in late May filled with sunshine, there was no reason not to go. It was warm enough to dig in nothing more than sandals, shorts and a a short-sleeved shirt – clamming attire I hadn’t worn since the days when I used to dig in Oregon. With king salmon fishing closed or limited on the Kenai Peninsula, our “secret” beach had a few more fellow clammers than we’d seen in the past but it still wasn’t at all crowded. And there were the usual assortment of bald eagles, sandpipers, gulls and a whimbrel with its long, beautifully curved bill prying the sand for worms and silvery little sand lances that had been left exposed by the neap tide. There were clams, too, but we had to work for them. We arrived at our spot about two hours before dead low and dug till the tide turned and began coming back in. Thirty clams between the two of us. Thirty-one counting the stray butter clam we added. Barbra had the eye for the shows on this morning, allowing us to do considerably better than most of our fellow clammers. 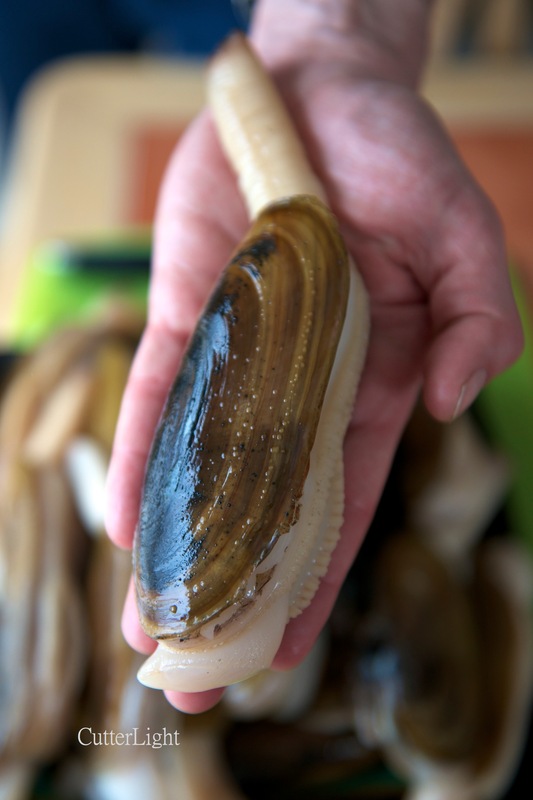 The state’s decision to reduce the razor clam limit to 25 seemed both wise and in a way unnecessary, as we suspect very few clammers found anywhere close to 25 clams. Overall, the size of the clams was good and the reward for our morning of digging was a feast of fried razors and New England Style Clam Chowder. We paired this meal with three different premium sakes, the first wines of this summer’s wine appreciation course we and another couple are taking. Ingredients: Have ready a cutting board or plate on which to position breaded clams, and another plate with paper towels to drain fried clams. 1/2 tsp rub/seasoning such as a Southwest rub, mesquite rub, or other rub featuring chili peppers. Our own blend features smoked chipotles, smoked paprika, oregano, and arbol chilis. In a Ziploc bag, mix flour, salt, pepper and seasoning to taste. Place crushed Saltines on a plate. Place eggs in a wide bowl. Add Cholula and thoroughly whisk together. Position in this order: cleaned clams, flour mixture, egg mixture, Saltines, plate or cutting board for breaded clams. In a deep fryer or on the stove in a deep pot, heat olive oil to 350 degrees F or slightly hotter. Use tongs to drop clams one-at-a-time into flour bag. Shake so that clam is thoroughly coated. Next, coat clam with egg mixture. Lift clam from mixture and let excess egg drip off, then roll in cracker crumbs. Set breaded clam on cutting board to rest. Repeat till all clams are breaded. Oil is ready when a few cracker crumbs bubble when placed in oil. Use tongs to place clams two-at-a-time in oil. Do not overload. Breaded clams should bubble fairly vigorously. Cook for one minute. Remember, clams will continue cooking even after they are removed from oil. Do not overcook. Place cooked clam on paper towels to drain. Repeat till all clams are cooked. Serve clams with a quality daigingo or junmai ginjo sake, a crisp Oregon Pinot Gris, or your favorite Alaskan craft beer. Note about cleaning clams: Even if you crack a few shells when digging, the cleaning can go quickly and it should be possible to serve sand-free clams and clam chowder. Here’s how to do it. Rinse clams in very cold water. Meanwhile, in a medium-sized pot, bring salted water to a boil. Use tongs to place clams one or two at a time into boiling water. The instant the shell pops open, remove the clam and plunge it into the ice bath. The shell and most of the sand will now easily come off. Additional rinsing after cleaning will remove residual sand. Thank you for writing this post. I have never tried to use fresh clams before since I didn’t know how to clean them. Check other sites on the web for instructions on how to remove the gills and the undesired parts of the digestive tract. It’s really easy. Thanks for reading! So good! Thanks for sharing that! these are some of my favourite shellfish, but so expensive over here! we do a chinese version with spring onions, ginger and oyster sauce – yum! 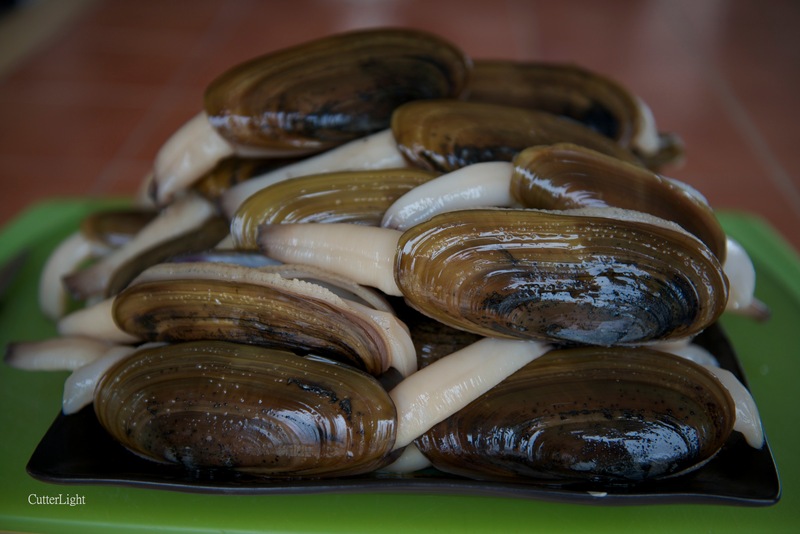 We imagine you get the thinner, more razor-shaped clams, which are also delicious. no thank you for sharing all of your wonderful recipes! I wish I lived close to the coast so I could have a steady stream of fresh seafood. This looks amazing! Yummmmm! I love razor clams. Great recipe! Those razors are huge! And it looks delicious!! Give the same recipe a try with finely crushed walnuts and almond flour instead of saltines and all purpose flour – the flavors of walnuts and almonds will meld with the razors really well! Thanks for the tip. We’ve done various crushed nut and nut flour recipes, but keep coming back to the saltines. But we agree, almonds in particular go well with razors. My pleasure – I enjoy your content, and look forward to your posts!